Dutch National Railways is introducing emergency plastic bags for passengers to urinate in as part of its first-aid provision on some commuter trains. Spokesman Jeroen von Geusau told the BBC "wee bags" would be installed on commuter trains without toilets. He said the bags were for use in emergencies such as power failures. "When you have to wait three or four hours on a train, then it is quite logical you have some people aboard who need to go to a restroom," he said. "It is like when a plane is circling above London for two hours." About 16% of passenger trains do not have toilets, the spokesman said, pointing out that the Sprinter services involved stop at stations every 5-10 minutes. The portable urinal, made by the firm Travel John, is designed for the use of "anyone without access to traditional or sanitary facilities", according to the company's website. The bag is attached to a spout and filled with a powdered substance that turns into a gel, AFP news agency reports. 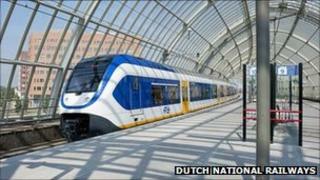 Rail passengers interviewed by Dutch TV were dismayed by the idea. "Are you serious?" said one unnamed female passenger. "No, no way, I just can't see myself 'going' in that. For a man it may be easier, for a woman that's just impossible." The Dutch scheme was not prompted by any one incident, Mr Von Geusau said, but after two hard winters in the Netherlands, "you need to be prepared".